The purchase of a Premium Starter Kit gives you a wholesale membership for life! So you save 24% off of retail! It’s a no brainer! The kit of 11 essential oils, a generous sample of Thieves Household Cleaner, and 2 samples of Ningxia Red, AND a BEAUTIFUL diffuser is on sale for $144! GET IT NOW! Then let me know so I can add you to our private oily support community! You’ll love everything about this decision and you'll have a new friend in me! Looking forward to hearing from you soon! 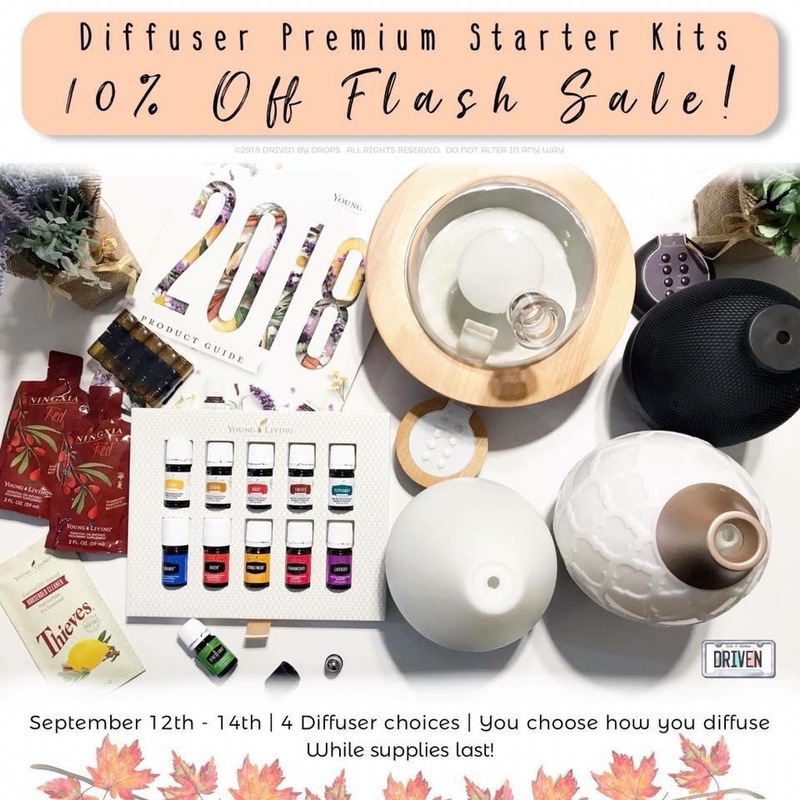 Premium Starter Kits are on Sale 9/12-14!!! This is so rare! Take advantage and get started today! There are over 600 Young Living Essential Oils and oil-infused products that will rock your family's world! Check out www.seedtoseal.com and find out why we are second to none. From the Seedlings baby-care line to the Animal Scents line for pets (small to large) and the Art skin care and Savvy Minerals make up in between, there are products for every body, every home. Young Living owns 16 of their farms and partners with others where the plants are grown (beyond organic) and I have been to some of the farms myself and seen the care that goes into the process from seed to seal. That's a promise you can count on! Young Living's integrity makes me so proud to be part of this company! The Premium Starter Kit is how I recommend everyone get started with Young Living. It’s the most bang for your buck, and it’s the gateway to a Young Living wholesale membership. Be sure to check Wholesale Member to earn your 24% off any future orders. (You never ever have to buy or sell anything in the future) Click Continue. 2. Then select the Premium Starter Kit and choose the diffuser you'd like! Desert Mist is my favorite. 3. Step 3 is for Essential Rewards, which is the BEST. BOX. EVER. If you know you're going to add more oils or makeup or baby products on top of the kit, I'd do this now! It's a monthly subscription box that is completely customizable. Free to join, free to cancel anytime, only requires 50PV (PV amount is almost always the same as dollar amount), and you earn a percentage of points back to use on FREE stuff. Oh and if you do this today, you'll automatically get FREE Orange Essential Oil + more awesome Oils depending on how much your order total is. They totally spoil us with this goodness. 5. Follow the process all the way through to the end....yay! You did it! Once you've completed your order, you will receive a confirmation email! Let me know if you don't get that order confirmation email for any reason. That's it!! Once I receive my email from Young Living that you're a new member, I’ll get you added to our amazing Facebook groups where you will have access to boatloads of information and resources! I’m SO excited for you to get your kit and start your journey with essential oils! I began my journey in March 2014 when I was struggling with a health crisis and was getting nowhere. A trusted friend introduced me to Young Living Essential Oils and I have been absolutely amazed and thankful from day one. I am passionate about giving back and helping others find what works for them. I will help you, and add you to our awesome support group where we are one big oily family! HaHa, that may sound cheesy, but it is so true! Most of us love helping a sister or brother out! I teach classes locally and online, usually weekly, to help you learn the what, when, how and why of essential oils and natural health support. Please contact me by email ([email protected]) or send me a message on facebook (https://www.facebook.com/profile.php?id=100000729654799) I would love to hear from you! Customer Support is my strength, so you'll be safe with me! I use YL products every single day. It is a lifestyle that I choose from the time I wake up in the morning until I go to bed at night. From an oil blend to support my endocrine system that I apply first thing every morning, the toothpaste I brush my teeth with, the wonderfully luxurious skin care and make up I use on my face daily, the sunscreen, insect repellent, plant based household cleaner, laundry soap, dish soap, to the supplements we take that are made more bioavailable to our bodies because they too are infused with essential oils becoming the key that unlocks the cells and allows them to be absorbed readily and quickly. And maybe the most important of all is the anti-oxidant drink called Ningxia Red we drink daily. It is perhaps the number one product for our health we use because it is a huge boost to our nutrition. We love the taste, and drink 2-4 ounces daily.